Troubled by acne, blemishes, or dry skin? Instead of going for commercial beauty products, opt for sandalwood powder (صندل سفید), which has been extensively used in ayurveda as a holistic way to treat skin conditions. Its numerous health and beauty benefits can treat skin rashes, blemishes, acne, and many other skin problems. Here are the benefits of sandalwood powder for your skin. Sandalwood is rich in antioxidants and help in prevention of wrinkle formation, as it fights the damage that is caused by free radicals. Hence sandalwood has been used as an anti-ageing remedy since time immemorial. It will increase the elasticity of your skin and prevent your skin from drooping and sagging. To 2 tbsp of sandalwood powder, add 1 tbsp of honey and 1 egg yolk. Mix all the ingredients well and make a paste. Apply the pack on to your cleansed face and leave it for 30 minutes. Dark and dull complexion can make you unappealing and unattractive. Topical application of sandalwood mixed with other natural ingredients clear skin naturally without any side-effects. To 1 tbsp of sandalwood powder, add 1 tbsp of gram flour (besan) and ¼ tsp of turmeric powder. Add required amount of rose water to make a fine paste. Apply this paste on to your cleansed face for 15 minutes. Sandalwood has a soothing and calming effect on the inflammation of skin caused due to pimples and acne. Our grannies have been using sandalwood for pimples and acne for centuries, and really leave the skin to be blemish-free. To 1 tbsp of sandalwood powder, add 1 tsp of milk. Mix well and apply on to your cleansed face and neck. Dab dry with a piece of cotton dipped in rose water. We all know that exfoliation is an important part of your skin care regime. It is also advised that exfoliation should be done using natural products to get better and effective results. Sandalwood powder is one of the best ingredients to use for your exfoliation. To 1 tbsp of sandalwood powder, add ½ tbsp of black chickpea powder and rose water as required to make a paste. Mix well to make a fine paste and apply on to your cleansed face. Massage gently on your face in circular motion for about 5 minutes. Now leave it for 30 minutes then wash it off with normal water. Following a long day out in the sun, your skin will be feeling pretty tender, but applying sandalwood powder to the area of inflammation can soothe the discomfort, speed the healing process, moisturize the skin and prevent excess skin peeling, which can leave scars behind. To 1 tbsp of sandalwood powder, add 1 tbsp of orange peel powder and 1 tbsp of yogurt. Mix all the ingredients well and apply the paste on tanned body parts. Let it dry completely then wash it off with water. 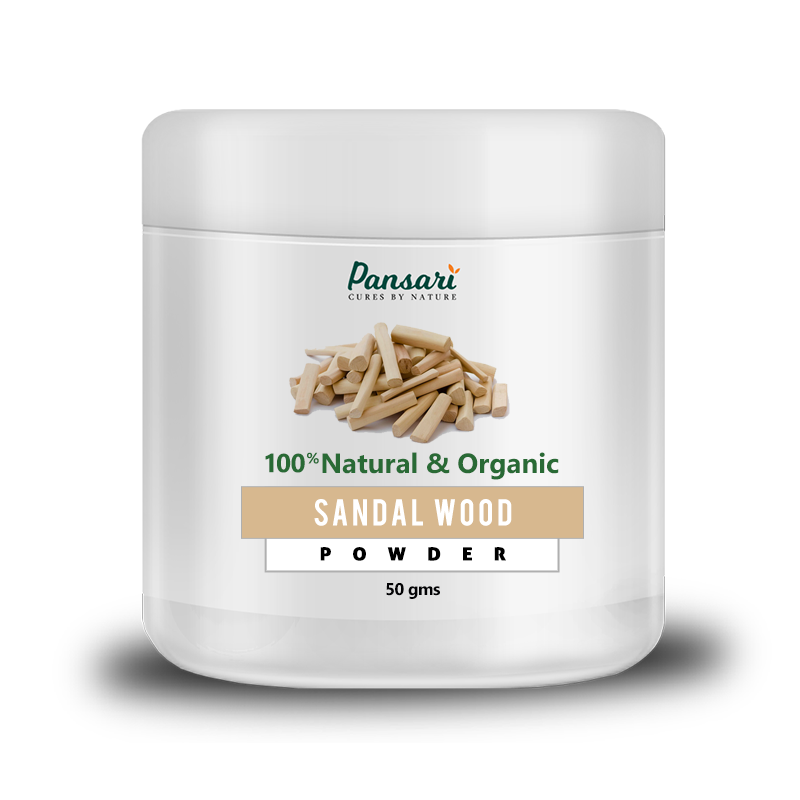 Pansari's Sandal Wood Powder is made from original Sandal Wood not Sandal Wood Peel.